All of the rooms at Hotel de Rome are soundproof and fully equipped with all the modern comforts you would expect of a 3 star hotel of this quality. Here at Hotel de Rome you have a choice of rooms, single, double/twin or a suite for that extra luxurious quality. Whether your stay here is for business or pleasure we are confident at Hotel de Rome that your stay will be comfortable. 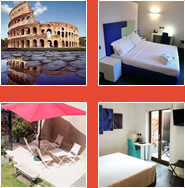 Luxurious 3 star accommodation in the heart of Rome near the Colosseum and opposite the Roman Forum. The rooms have been furbished in a modern and contemporary fashion, with exceptional use of colour creating a bright and sophisticated style, a style reflected throughout the hotel. Our luxury rooms in Rome are also clean, crisp and secure to ensure your stay is truly hassle free. Sophisticated and contemporary accommodation equipped for your accommodation needs and more.